Would you like to be our Friend? The Library plays an exciting and extensive role in our community. As Friends, our mission is to support the Library and its many services through donations and projects whose proceeds enhance use of the Library and encourage reading. Individuals and families are invited to join the Friends of the Cerritos Library, and share in the continued support for the services of the Library. Please call (562) 916-1350 for more information about the Friends of the Library. 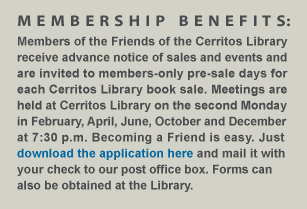 Everyone is a Friend of the Cerritos Library. But why not formalize the relationship? Friends History: Organized in 1972, the Friends of the City of Cerritos Public Library, Inc., was established with the purpose of promoting the use of the Library and its many services through donations and various projects. The Friends were instrumental in making the Cerritos Library the first public library in the United States to be dedicated to the nation’s First Ladies of the White House. Portraits, personal items, autographed books, the Franklin Mint collection of First Ladies’ coins and quotations from Bess Truman, Mamie Eisenhower, Jacqueline Kennedy, Lady Bird Johnson, Pat Nixon, Betty Ford, Rosalind Carter, Nancy Reagan, Barbara Bush, Hillary Rodham Clinton and Laura Bush make up this special collection. Materials will be added to this collection throughout the years. 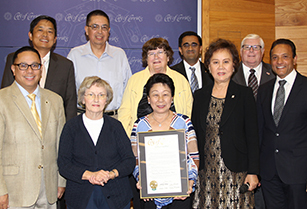 The Cerritos City Council honored the Friends of the Cerritos Library for National Friends of the Library Week in 2017. Pictured in the front row (left to right) are Mayor Pro Tem Mark E. Pulido, Friends Historian Joanne Witt, Friends President Janice Dawson, Mayor Grace Hu, and Councilmember Naresh Solanki. In the second row (left to right) are Councilmember Frank Aurelio Yokoyama, Friends Vice President/Membership Manuel Ortega, Friends Vice President/Programs Tracy Winkler, Friends Treasurer Dhyanesh Bhatt, and Councilmember Jim Edwards. The Friends of the Cerritos Library was commended for its dedication to supporting the Cerritos Library through volunteer service and funding for programs such as the Summer Reading Program, art and writing contests for students and library celebrations for staff and patrons. The Friends of the Cerritos Library understands the critical importance of a well-funded library and makes significant contributions to the Cerritos Library by organizing successful book sales, staffing the Friends of the Cerritos Library book store, presenting the Homework Help program and helping to promote library services. The members of the Friends of the Cerritos Library set an example for all in how volunteerism leads to positive civic engagement and the betterment of our community. The City Council encouraged everyone to join the Friends of the Library and thank the members of the group for all they do to enhance our library and community. The Friends have made many generous and helpful donations to the Cerritos Library. In 2018, the Friends contributed $15,000 to support the Cerritos Library’s purchase and implementation of a replacement radio frequency identification (RFID) system. In 2013, the Friends donated $30,224 to the Cerritos Library for the purchase of 48 new computers for use by the public.